Sri Lanka’s state-owned Board of Investments (BOI) opened a one-stop service center at the Hambantota International Port, in southern Sri Lanka, on Saturday evening to attract investors from the global port industry to invest in the island’s south. CM Port entered into a partnership with the Sri Lanka Ports Authority in 2017 to develop and manage the port. Following the launch of the new center on Saturday, the BOI said it will play the role of facilitator to provide all information about Sri Lanka’s investment policies to those interested in investing in Hambantota to improve Sri Lanka’s ranking in the World Bank’s Ease of Doing Business Index. The BOI said the Hambantota Port was targeting port-related investments within the 3.5 square km area allocated for the Hambantota Port’s development. Sri Lanka’s Minister of Development Strategies and International Trade Malik Samarawickrama, speaking at the opening ceremony, said the launch of this one-stop service center was a landmark event in Sri Lanka’s economic history and a remarkable milestone in the development of the southern province. “Today as we embark on this new phase of development in Hambantota, I want to thank CM Port for their partnership and courage. Their expertise in successfully operating dozens of similar port operations around the world will no doubt contribute in making the project here a success,” Samarawickrama said. “My ministry will do everything possible to attract investors to come here. Our government looks forward to working even more closely with the government of China to bring progress and development to our country and to improve the living standards of the poor people, particularly in this area,” he added. 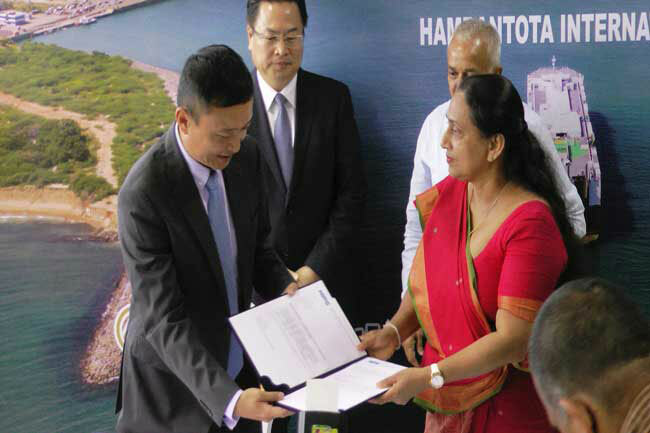 Chinese Ambassador to Sri Lanka Cheng Xueyuan said the opening of this new service center was yet another milestone in the co-building and operating of the Hambantota Port between Chinese and Sri Lankan companies and it laid a solid foundation for promoting the development of the Hambantota Industrial Zone.